**Disclaimer: I received a sample of 2Toms SportsShield for Her! Roll-On to review as part of being a BibRave Pro. Learn more about becoming a BibRave Pro (ambassador), and check out BibRave.com to review find and write race reviews! Oh the dreaded chaffing, an unfortunate evil for the distance runner! No matter what I’ve used in the past to try to avoid it I inevitably would need to grab some vaseline mid-marathon to re-apply both along my bra-line area and under my arms where they’d rub on my tank top. Last year during the Hartford Marathon a friendly on-course support volunteer on a bike even biked ahead and got me some (seriously, the course support at that race was AWESOME!). So, I have to admit when I first tried 2Toms Sports Shield I was skeptical that it would by any different. Sure it would work at first, but I was also pretty sure that around mile 20 I’d be keeping an eye out for the next aid station with vaseline on a stick. 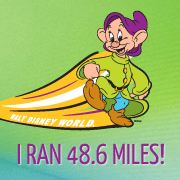 I tried it for the first time at the Walt Disney World Marathon this January. Yes, I know, I tried something new on race morning, a major running/ racing no no. But, I did it. And you know what? That was the 1st of my 9 marathons that I didn’t stop to get mid-race vaseline to re-apply! I will admit that when I first put it on in the hotel room that morning my reaction was, “whoa, this stuff is kind of greasy…”, but it was that “kind of greasy” texture that makes it really work! And that being said, it wasn’t like, end up with grease stains on your running clothes greasy. 2Toms Sports Shield comes in 2 forms – the roll on and the single use wipes. I actually REALLY like the single use wipes. Not only are they easily portable to stick into your race day bag (I even threw a few in my bag for Italy since I knew we’d be doing a lot of walking! ), but I loved that with these handy wipes I could easily swipe them around my heels and between my toes, both blister problem areas for me on long runs. The roll on was great for getting around my bra line area and I’m sure come summer when I break out the running shorts I’ll love it for my legs. Interested in trying some 2Toms? Use code ‘2Toms20’ for 20% off your order through April! Great review. I’ve been using this product for about 6 years and it has never failed me. I did not know that they have wipes. Those would be very convenient for those areas where you would not want to use a roll-on!